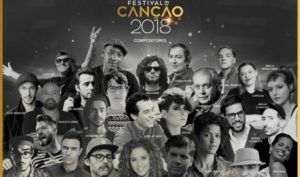 Festival da Canção: What to expect for the 2018 edition? Portuguese broadcaster RTP invited new and old composers, known from anything between jazz and electro, some expected, but also some unexpected one. We take a look at what to expect from the 26 composers for the 2018 edition of Festival da Canção. Last week, the line-up of composers for the Portuguese national selection were announced. Overall, 26 composers were selected. Out of those, 22 were formally invited by the broadcaster – RTP – while one was invited by 2017 Eurovision winner Salvador Sobral. The remaining three were selected by the radio station Antena 1, out of 346 submissions. Next year’s show will be built off from two semi finals that will select seven out of 13 songs each. The 14 that will make it through to the grand final will be performed one last time, on March 4th in Muiltiusos Guimarães. One will be crowned the winner and represent the country on home field at the Eurovision Song Contest in May. If we go back to Festival da Canção 2017, RTP reinvented the show by providing greater space for diversity and new artists. The mission was so well succeeded that Portugal won the Eurovision Song Contest for the first time ever and it looks like they’re not stepping back their game next year just because the country is guaranteed a place in the final. In fact, not only did they increase the number of composers, but invited a big mix of musical genres to make sure the right song is chosen. There is not one, but two former Eurovision acts that will return to Festival da Canção along with a third one solely related to the Portuguese’s national selection show: Fernando Tordo (1973), José Cid (1980) and Jorge Palma (Festival da Canção, 1975). Let’s start with the older one (with all due respect), Fernando Tordo. One can expect the singer to bring some Fado to the table during this year’s Festival da Canção. Actually, it’s hard to recall an edition of the event where Fado wasn’t present. Either way, two other composers – Júlio Resende and Diogo Clemente – are most likely delivering songs in the same genre. As for José Cid, this will mark his 14th participation in the show. The last one takes us back to 2007, when the singer was in charge of Na Ilha Dos Sonhos production. Even though the Portuguese legend is better known for his progressive rock music, his admiration for Salvador Sobral may direct him towards a jazz entry. In fact, Jazz may end up being one of the most explored genres in next year’s edition. Besides Cid and JP Simões, also Janeiro – Salvador’s invited composer – will most likely present a jazz entry despite of his rock and electronic influences. Rita Dias (chosen by Antena 1) could also go with an entry of the same genre as her music style could easily be compared to Salvador’s sister, Luísa Sobral. Either way, folk isn’t out of the way for the Portuguese singer. Pop rock is another music genre that won’t be forgotten in Festival da Canção 2018 either, as Jorge Palma will obviously serve something alike. Nonetheless, he surely won’t be the only one. Miguel Ângelo – from the popular group Delfins – is also known for producing music within that genre. While the Portuguese culture will be highly represented through Fado, there will be space for more cultures. Africa and Brazil, for instances, will also take part in Festival da Canção 2018. Paulo Flores, Tito Paris and the Angolan Aline Frazão will bring the African flavor to the stage while Mallu Magalhães will be in charge of a Bossa Nova entry. Capicua, on the other hand, will prove that Portugal is not solely represented by Fado as the Hip Hop singer will bring unprecedented sounds to the show. Daniela Onis (chosen by Antena 1) and João Afonso will be in charge of the folk and acoustic sounds while Peter Serrado (also chosen by Antena 1) and Paulo Praça of simple Pop sounds. A mix of alternative, indie and electronic music will also be part of the show with names such as Isaura (a Portuguese version of Halsey and the only one who will most likely sing in english), Francisco Rebelo (from the group Orelha Negra) and Armando Teixeira. Three names are yet to be presented. All of them represent yet another music genre. Francisca Cortesão – part of Minta & The Brook Trout – has an old school vibe mixed with soul music. On the other hand, Benjamim will certainly be in charge of the happy tune of the year due to his Pop feel good music. Did we keep the best for last – that depends on everyone’s taste – we end the biggest surprise of the year: Diogo Piçarra. Diogo won Portuguese Idol’s fifth edition and later became one of the biggest names in Portuguese music. Mixing Pop with R&B, Diogo Piçarra can easily be considered Portugal’s version of Justin Bieber. Each song released becomes a radio smash hit and every concert he announces, sells out quite quickly. Diogo will certainly be the reason a lot of people will tune in to watch next year’s edition, and too early to tell, but maybe also the favourite to win.